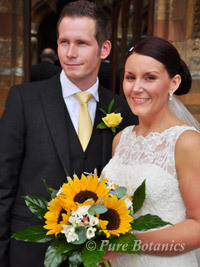 When Emma first got in touch with me, she knew exactly what she wanted for her bridal bouquet and she had her heart set on a sunflower wedding flower theme. 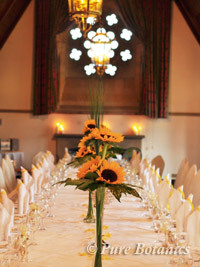 Emma had a May wedding at Ettington Park Hotel and it was the perfect time of year for sunflowers. 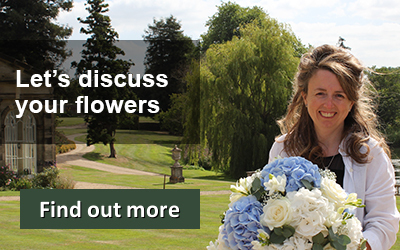 Here you can see (photo above) Emma holding her bouquet outside the entrance to Ettington Park. 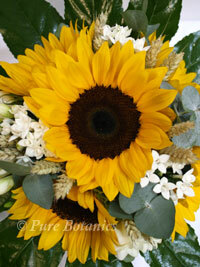 I created her a handtied posy bouquet of sunflowers, white bouvardia, freesias, wheat, eucalyptus and fatsia leaves. 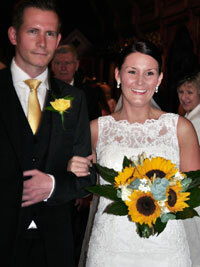 Sunflowers are too large for buttonholes so the groom had a colour coordinated yellow rose. The couple had a civil wedding ceremony upstairs in the beautiful long gallery at Ettington Park. I placed two of their table arrangement at either side of the registrar’s table. 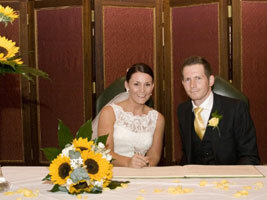 As the couple were also holding their wedding reception in the long gallery it made sense to use the table arrangements as decorations for the wedding ceremony as well. The rest were placed on the bookshelves and fireplace that feature in this stunning upstairs room. 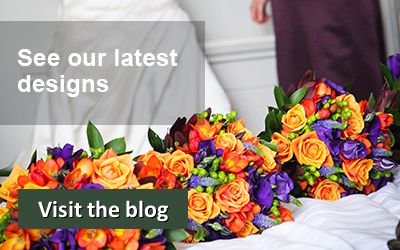 For the tall wedding centrepieces I placed sunflowers, fatsia leaves and long strands of steelgrass to add height to the arrangements. The long gallery really suits tall wedding centrepieces as this room has such a high ceiling. We have decorated this room many times before for wedding receptions and have lots of different wedding centrepiece designs that work really well in this room. 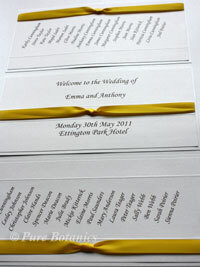 Emma followed through the yellow colour theme to all her wedding table stationery including her table plan that you can see here (above right). 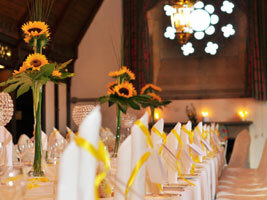 This sunny yellow colour theme worked really well in the room. 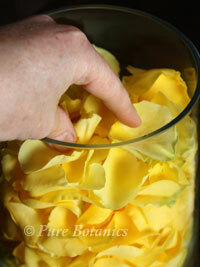 I also supplied fresh yellow rose petals that were scattered in-between the vases to add colour on the tables.